Shawn Berger was a Decepticon ally when they briefly convinced humanity briefly that the Decepticons were good and the Autobots were evil. Base of Operations: Central City. Height: 5’11” Weight: 370 lbs. Shawn Berger has no extraordinary physical abilities. His sole extraordinary skill is convincing people of his causes, and even that disappears when Megatron reveals their alliance. 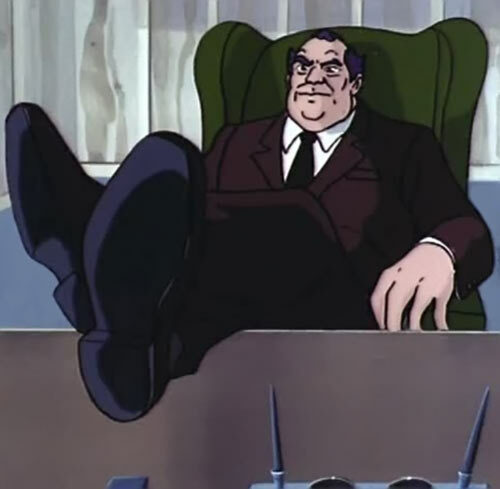 After losing a mayoral election in Central City, Shawn Berger donated a fake solar energy plant for the Decepticons to raid. In this way, his private army could “defeat” them and make Berger look heroic. The Decepticons easily defeated Berger. But the Autobots repulsed the Decepticons, prompting the Mayor to declare Autobot Day to honor the heroes. Berger, meanwhile, allied himself with Megatron. They made a short film featuring supposed Autobots stealing energy from random locations. It was meant to overturn human conception of the Transformers conflict. 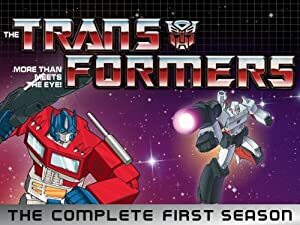 Once that film aired, the Autobots were arrested, tried, and banished from Earth in a ship provided at Berger’s expense. Megatron then used Teletran I to redirect that ship into the sun. Once it was destroyed, Megatron revealed his true intentions again, as well as Berger’s conspiracy with him. Berger was enslaved with the rest of Central City. But after seeing the Autobots apparently destroyed, he didn’t mind, realizing he deserved it. An unnamed unit of military planes tried to free Central City, but was no match for the Decepticons. Chip Chase escaped to Autobot Headquarters to find what he could with Teletran I. But he saw what Berger had said, that the Autobot ship had been destroyed. Before he could find Cosmos’s fate, Thrust crashed in and destroyed Teletran, inadvertently releasing Cosmos from his solar bound course. Shawn Berger was an obese businessman. He usually wore brown slacks and blazers, white collared shirts, and black neckties and shoes. He wore a black tuxedo on Decepticon Day, but didn’t close the neck on the shirt. Shawn Berger was bent on amassing as much power as he could, until he saw where the pursuit of that power led. Once he saw the Autobot ship, he reformed and tried to make up for his misdeeds. But unlike Ebenezer Scrooge, no one believed him. If this occurred in DC’s Central City, it’s most likely that Barry Allen was in the Anti-Monitor’s custody at this point, or recently deceased. The JLA might have been sent to free Central City after the Air Force’s attempt, and perhaps one by G.I. Joe, had the Autobots not returned when they did. Connoisseur, Gift of Gab, Scholar (Business, Politics). Source of Character: Transformers (1985 TV Episode: Megatron’s Master Plan). Writeup completed on the 23rd of September, 2018.